The Politics of Thanksgiving - Art Exhibit and Deliberative Forum Will be Part of Examination of "The History of the United States Through the Lens of Thanksgiving"
A deliberative public forum about the issue of immigration will be included in the programming planned as part of an art exhibit at the Russell Library at the University of Georgia. The art exhibit, We: American Thanksgiving Conflict and Communion will feature the work of two artists; sculptor and potter Micaela Hobbs, and painter Jennifer Niswonger. 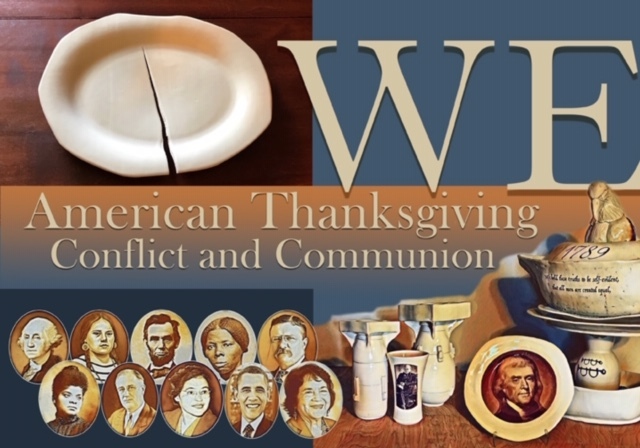 The Russell Library will cover new territory this October when the installation "WE: American Thanksgiving Conflict and Communion" opens on Monday, October 29, 2018, in the Harrison Feature Gallery of the Richard B. Russell Special Collection Library. 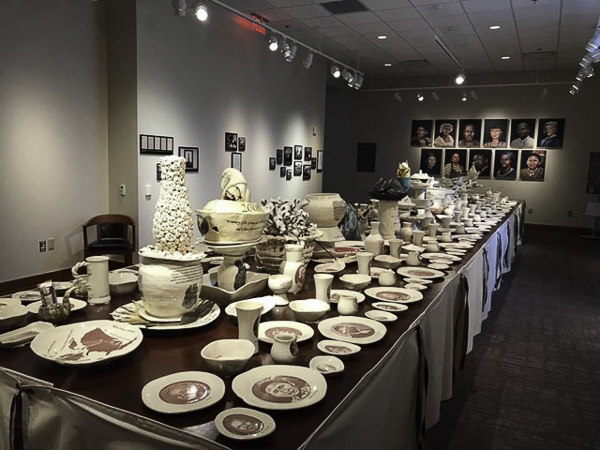 Created by local sculptor and potter Micaela Hobbs, in collaboration with painter Jennifer Niswonger, the exhibit examines the history of the United States through the lens of the Thanksgiving dinner table. The concept is presented as a series of place settings and serving pieces. 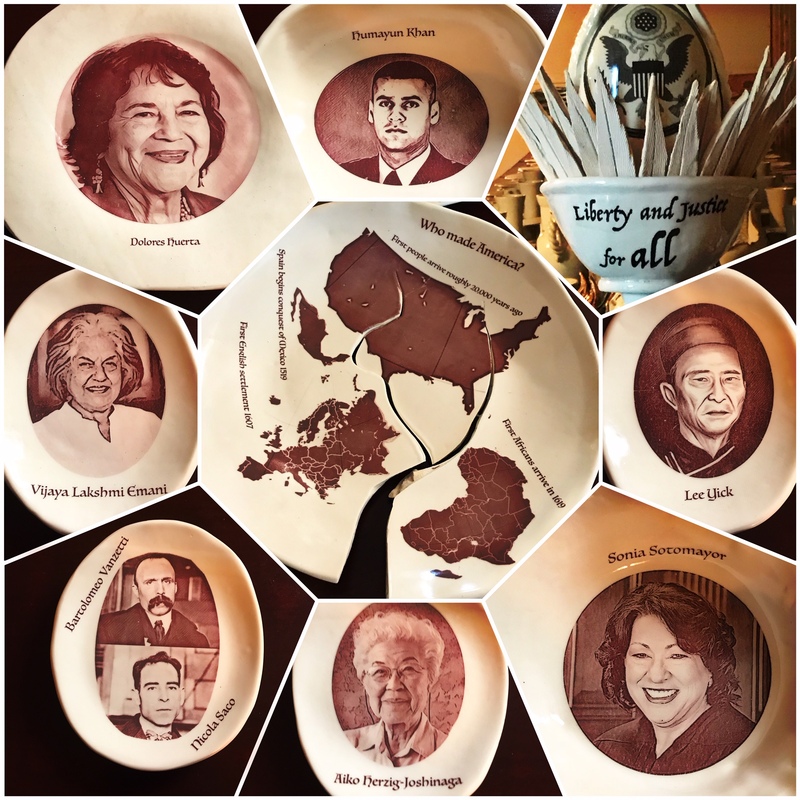 Each piece is decorated with images of an individual or institution that played a part in shaping American history. The tablescape is punctuated with centerpiece sculptures that reflect the artist’s synthesis of each era of history. The installation asks visitors to imagine the conversations and arguments between and among these figures if they had all sat down together around the Thanksgiving table. Jill Severn and Margaret Holt will moderate the deliberative forum on November 29th at the Russell Library on the University of Georgia (UGA) Campus, 7-9 p.m. Courtney Davis will serve as reporter/recorder for the forum. All are welcome to attend. "The immigration issue affects virtually every American, directly or indirectly, often in deeply personal ways. This guide is designed to help people deliberate together about how we should approach the issue. The three options presented here reflect different ways of understanding what is at stake and force us to think about what matters most to us when we face difficult problems that involve all of us and that do not have perfect solutions." Excerpt taken from the National Issues Forum Institute (NIFI) issues guide, Coming to America: Who Should We Welcome, What Should We Do? Please join the Russell Forum for Civic Life, the civic engagement program of the Russell Library, for a deliberative community forum on immigration following a brief tour of the WE: American Thanksgiving Conflict and Communion exhibit with the artist. With the help of trained neutral moderators, participants will weigh and discuss consider three options to tackle this complex issue. All ideas are welcome. Read more about the WE: American Thanksgiving Conflict and Communion exhibit in this article: Art Installation by Local Sculptor Examines the Politics of Thanksgiving. Richard B. Russell Special Collections Library, Room 277.